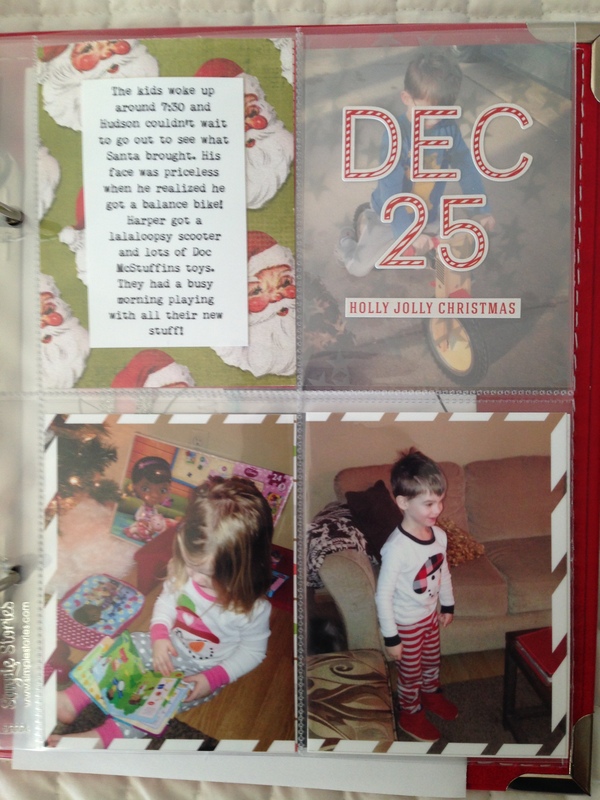 Still catching up on posts, so here are days seven through ten. Enjoy! 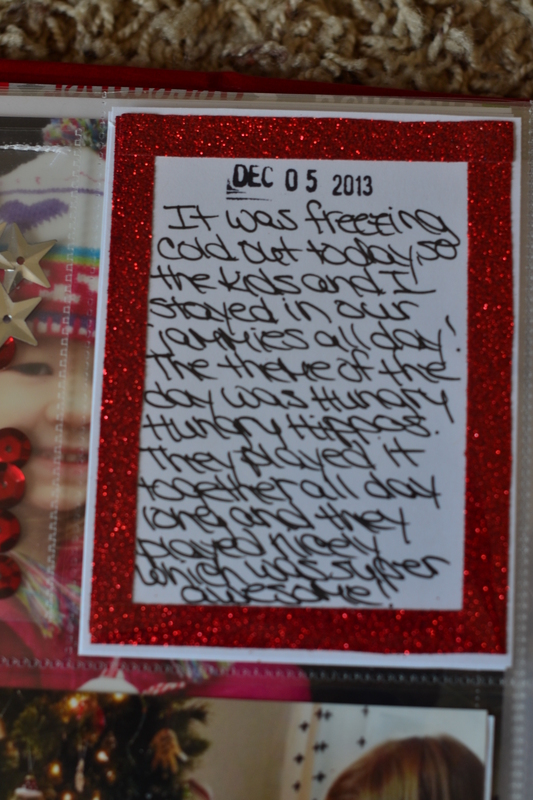 This was the day that the kids wrote their letters to Santa. I had a hard time with this page. 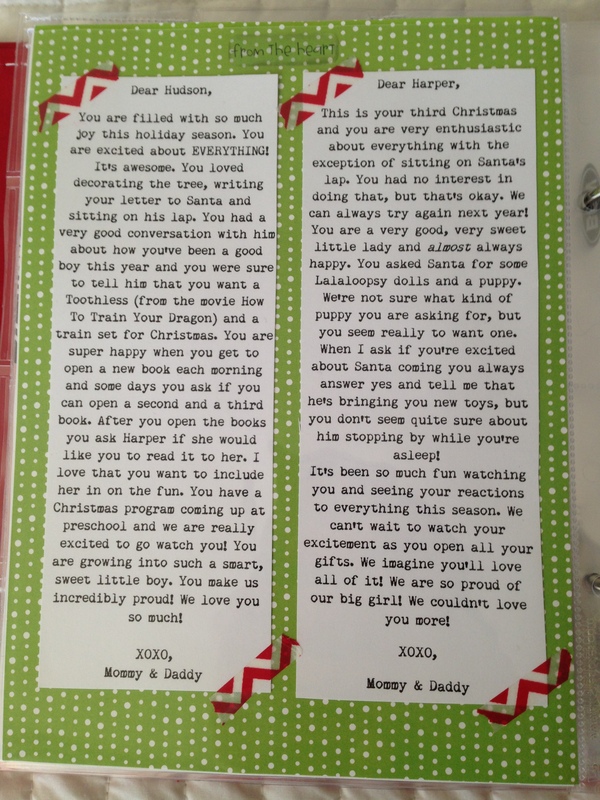 I wanted to include a photo of the letters, as well as, journaling and photos of them. 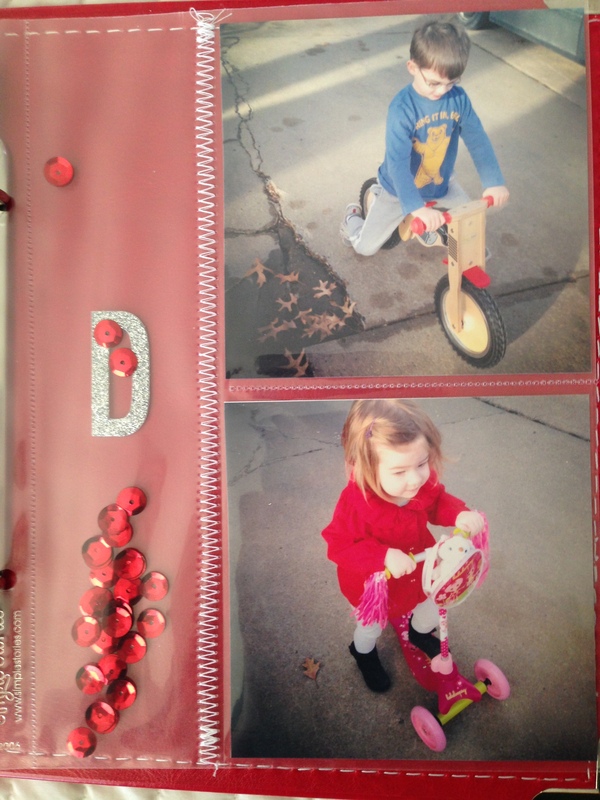 I opted to include a page that I cut down to about 2 1/2 in wide and 8 in long for their photos. I’m pretty happy with the outcome. Today I added our Christmas card. 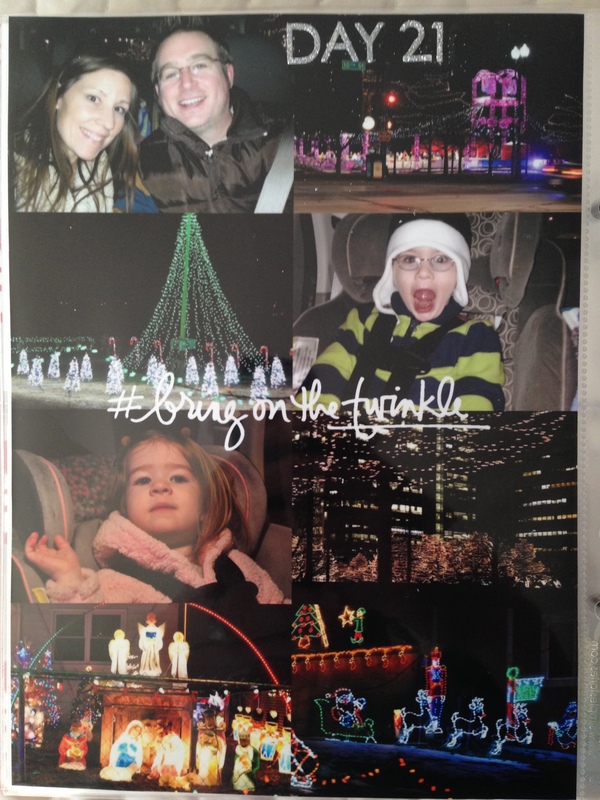 I went traditional this year instead of a photo card, but I did attach a family photo to the inside of each card. I love the way this page turned out. 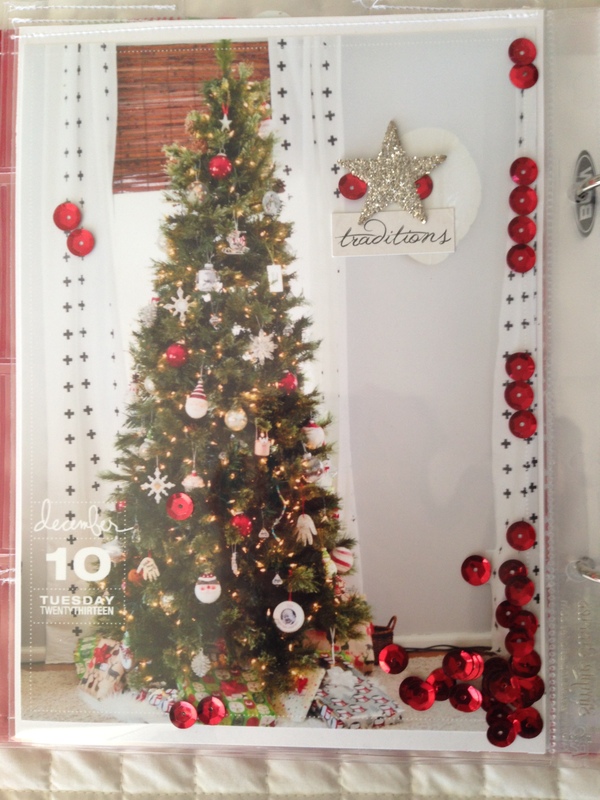 I sewed the card to the center of the 6×8 pocket page and then added the sequins and tab at the top and stitched it closed at the top. This was the day we had our Santa Search. The kids were super excited about it, so I decided to add it to the book. Just a story about the fun they had and a small collage of photos from the hunt. I like these 4×4 pockets pages. They’re great for Instagram photos. Today as part of our Advent, we were took the kids to Starbucks after Hudson got out of school to get them each a snowman cookie (we’ve taken them too late the last two years and Starbucks was completely sold out.) and we got some coffee. Then we took them to a local nursery where they had some of Santa’s reindeer on loan. It was such a fun little afternoon. 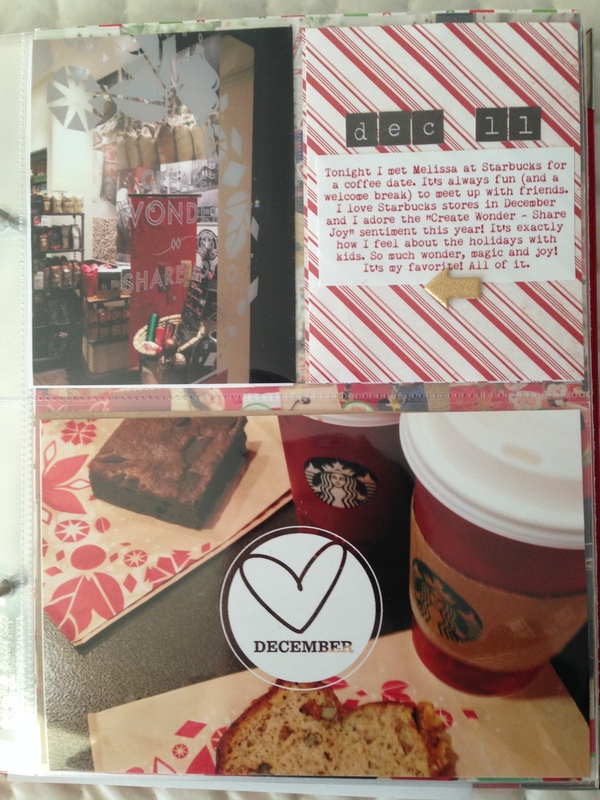 I was excited to include one of the Starbucks bags into the album; especially this one that reads “Share The Merry”, which is exactly what we were doing. They always have the best holiday sentiments. 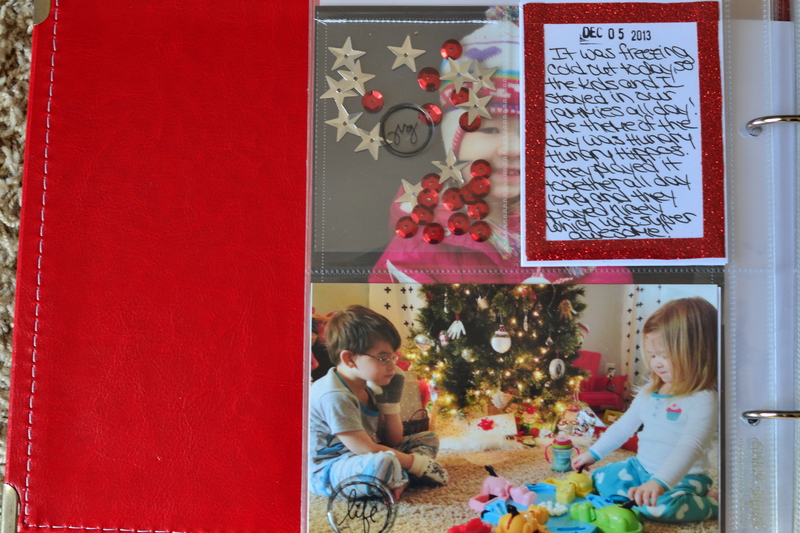 I included the journaling on a card that I slid into the bag. 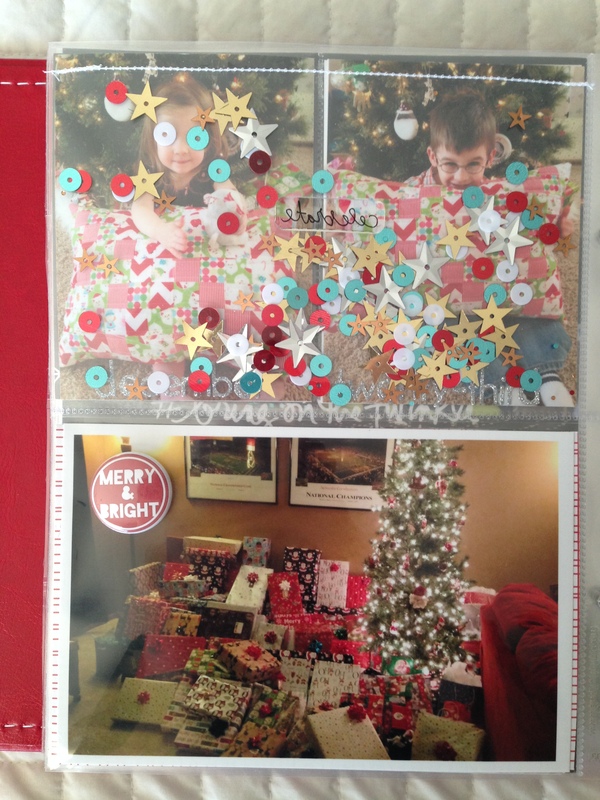 I really liked the confetti in the December Daily kit and I just so happened to have a bag of it, so I picked out the traditional Christmas colors of red, green and white and then added some light blue too. I love the look! See you tomorrow with some more pages! Let me know if you have any questions about any of the products I used. Hello! I’m mostly caught up with my album so I’ll be posting a few days at a time. Here are days three through six. I added decorating our tree for day three even though we did it way back in November. I usually do a collage for this because I always have a bunch of photos I want to include. Our week was FULL of appointments, haircuts, school and ballet so I wanted to add a page that just showed the normal stuff that was happening. The kids were overdue for haircuts and I wanted to make sure to get them in before all the Christmas festivities began. 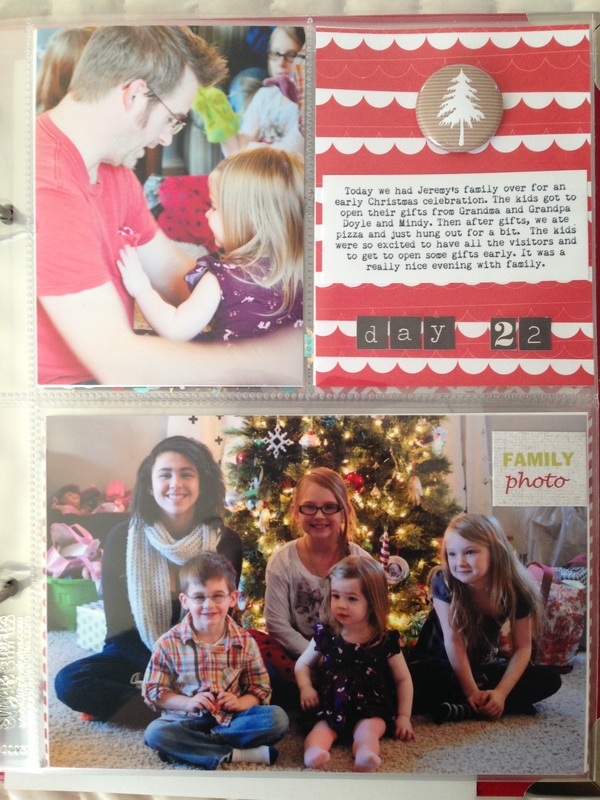 I added in an extra flip pocket so that I could include photos. Because we’d had such a busy week, I wanted to document our relaxing Friday night. So simple. This shot shows the back of the flip pocket. I simply included our initials and the date, which I stitched to the paper. This was the day we made our graham crackers houses. It’s a favorite activity for everyone, so it always gets a page in the book. 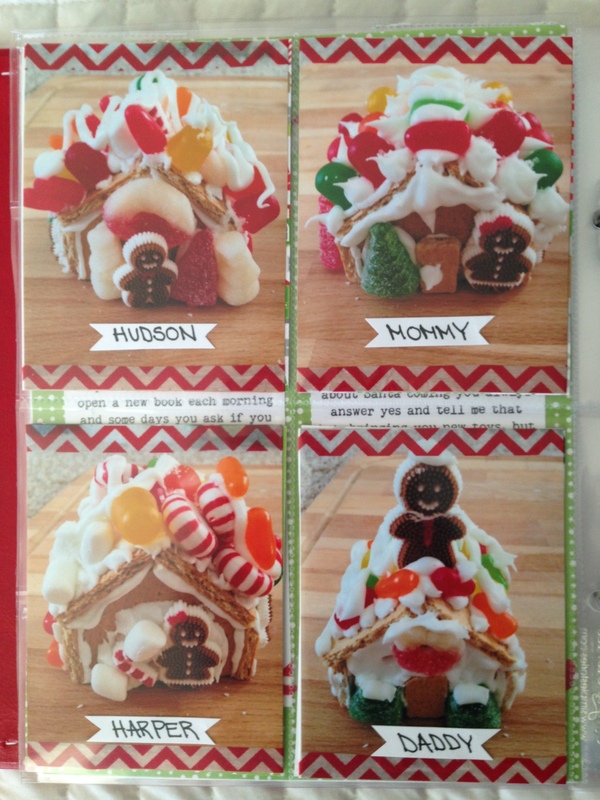 Plus, they always turn out so different every year that it’s fun to look back at them. I haven’t added the journaling yet. 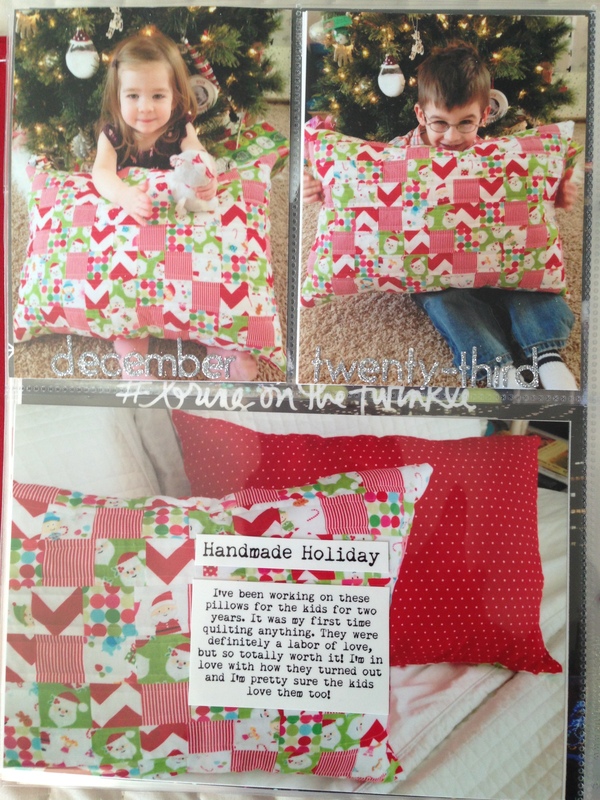 I can’t decide if I want to add an extra pocket, just an insert or if I want to go back and add it to the photos like I wish I would’ve done to begin with. I’ll be back tomorrow with more pages. If you have any questions about any of the pages please don’t hesitate to ask! Because my printer was out of ink and I didn’t get out to buy more until Sunday, I got a few days behind on my December Daily. But I’m catching up. I worked on it a bunch yesterday and I plan to get completely caught up today. So, I’ll be back tomorrow with all the days pages that I missed posting. P.S. I’m totally loving how this album is turning out so far! I used this photo of Harper for Day 2. It was a quiet day. The days are much quieter now that Hudson is in school all day. Harper doesn’t usually play alone back in her bedroom though, so I liked catching her in that calm, quiet moment. Especially when this season can be so crazy. 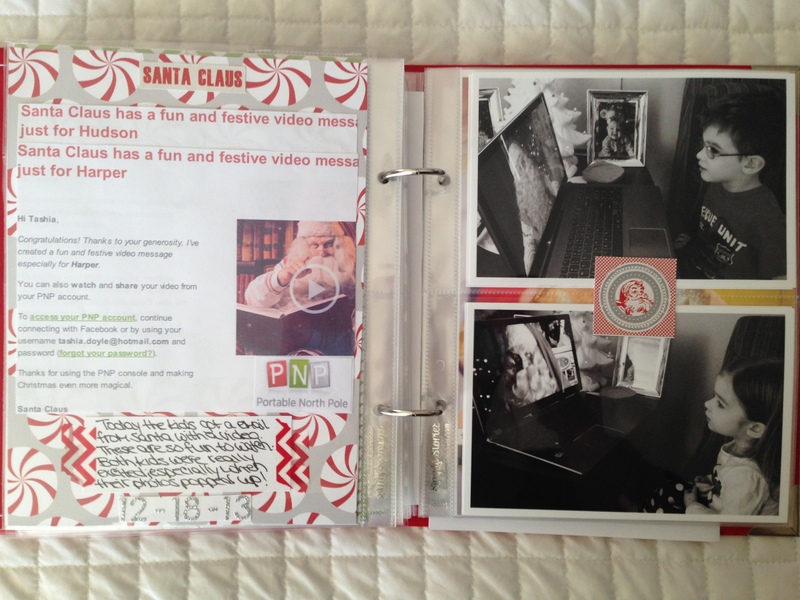 Today I’m wrapping up my December Daily posts. I had to finish one of my pages over the weekend and now the album is complete. Glad to be done and oh so very happy about how this album turned out! My favorite so far! 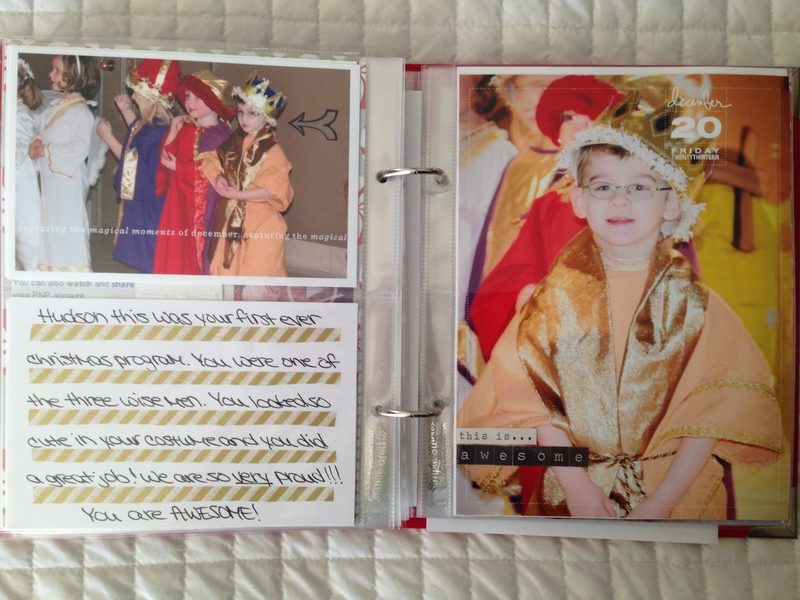 Warning: This is a very long post with lots of photos of album spreads, so if you’re not into that, feel free to skip it. 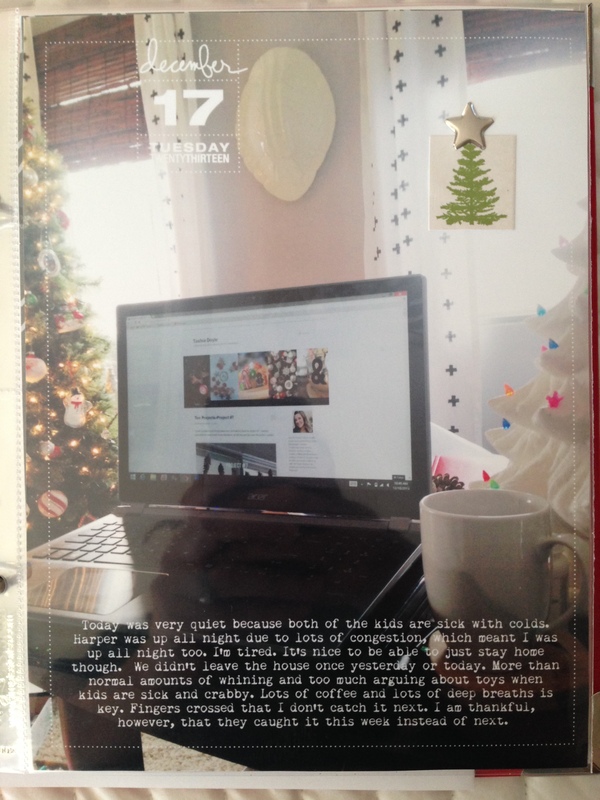 Today I kept it simple and added our holiday card. 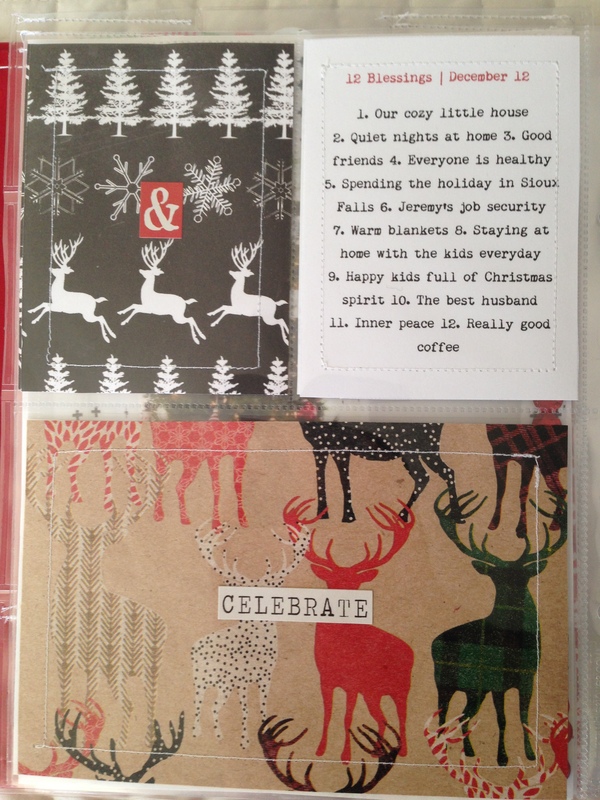 I add our card every year, so I knew this would be one of my pages at some point. Today I was inspired by Ali Edwards. I didn’t have a story today, so I followed her lead and took a photo of our tree during the day. I’ve actually never done this before, so I was happy to include it in the album. I love the tree at night, but I was really loving it during the day this year too with the curtains hung behind it. 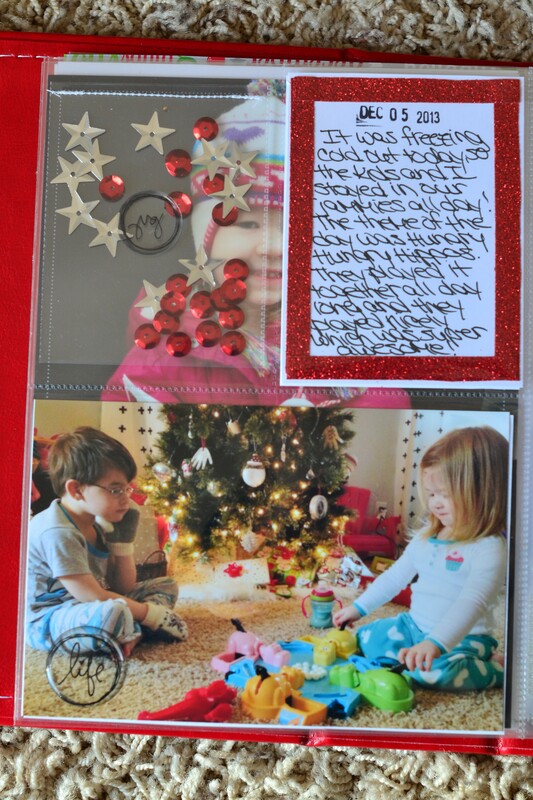 I also loved how Ali added sequins to her page. 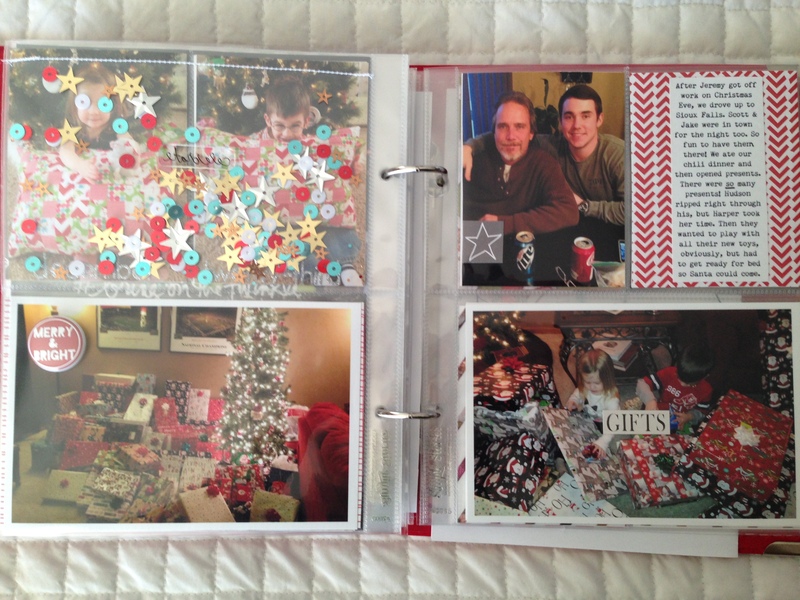 I was already using sequins throughout my album and planned to do a full-page with some and I thought it would work great over the tree shot. Then I sewed the top closed. Today I met up with a friend for coffee at Starbucks and couldn’t resist taking photos of the sentiment on the door that I’m loving so much this year. I didn’t get a photo of us, but I did get one of our treats, so I added that. 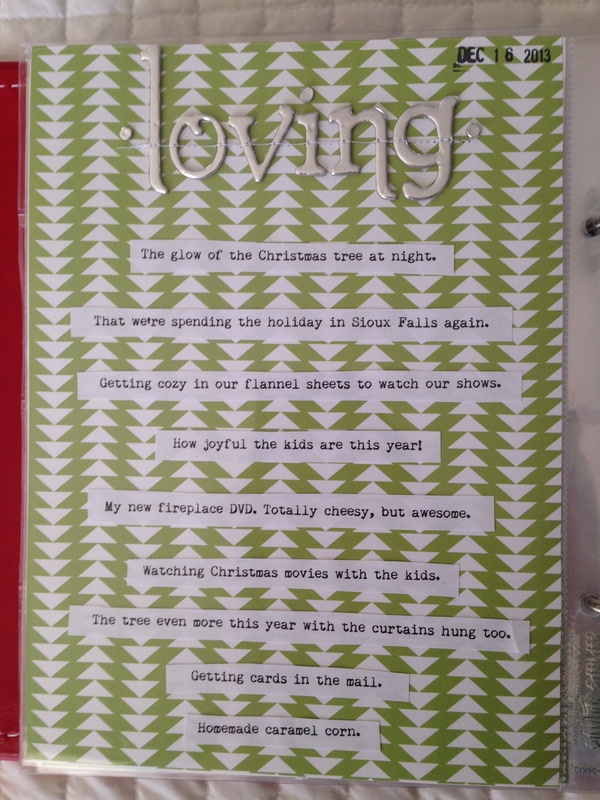 Ali shared a prompt that she used for today; 12 blessings on December 12th, and I thought it was such a good idea. I added my 12 blessings of the season, some of my Christmas wrapping paper ( deer paper from Target and the coolest wrapping paper I’ve ever bought!) and decided it would look cute to stitch around each one. Love it! Once again, simple, but awesome! We had our picnic by the Christmas tree today. 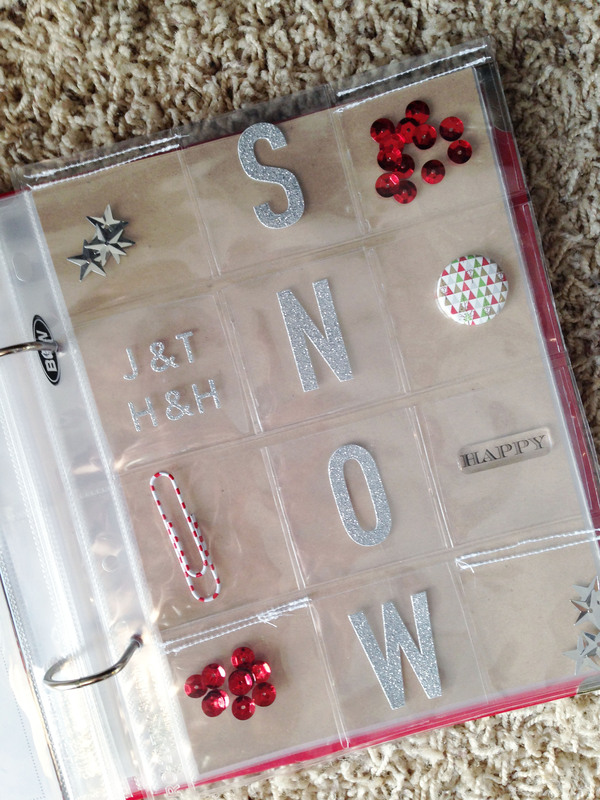 It’s one of the activities from our Advent calendar and the kids just love it. I took a bunch of photos that I wanted to include, so I decided to create a collage in order to fit them all in. Today I added letters to the kids. I’ve done this every year and really like being able to go back and read them. It feels a little silly writing them, but I think it’s a great way to tell the kids a little bit about themselves at the time. I hope they like reading the when they get older as much as I do. I’m pretty sure I’ll continue to write these for every album. And on the right side of the spread I added different patterned paper to each pocket, as well as the date and some embellishments. This was the day we decorated our graham cracker houses. This is a favorite activity for the kids and me and my husband. It’s so much fun and really simple to set up. This is our third year making them and it’s fun to look back at old albums to see how different they are each year. 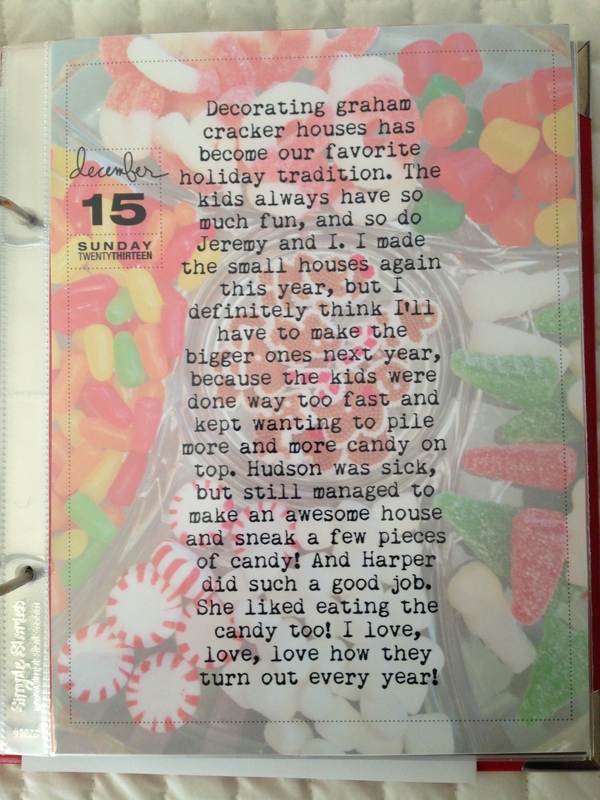 I took a photo of each person’s house for the left side and then added an enlarged photo of the candy tray, which I lightened the opacity of and added journaling on top. 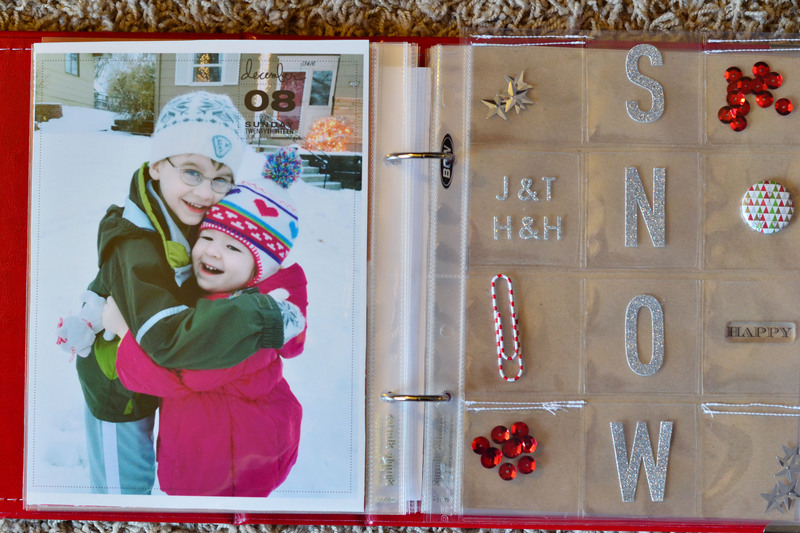 I was a little behind on my pages, so I added this journaling page today using the prompt loving, and then added a list of all the things I’ve been loving throughout the season. An easy way to catch up or a simple story to tell if there wasn’t much happening that day. 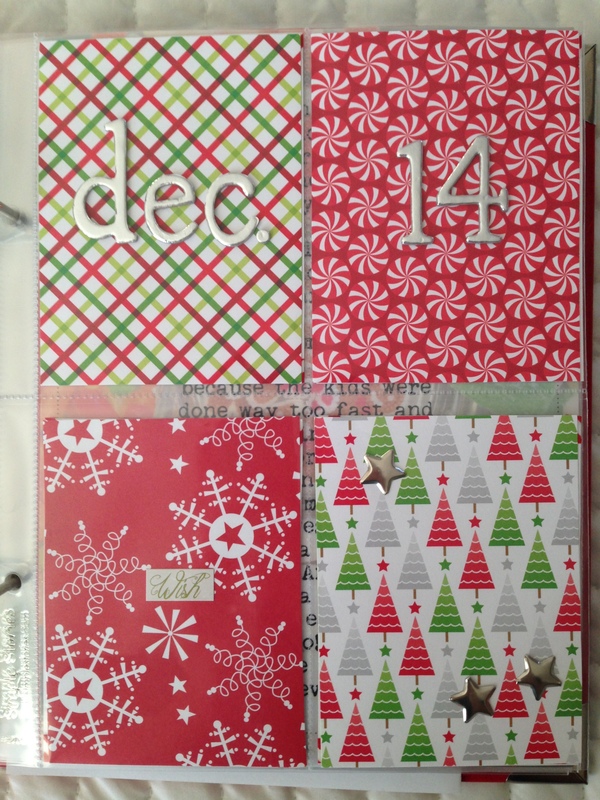 I love the green patterned paper! Today was a very quiet day around our house. Both kiddos were under the weather with colds and I was really tired from being up most of the night with Harper. I ended up simply taking a photo of my morning view and adding a bit of journaling about our day. It turned out to be one of my favorite pages. 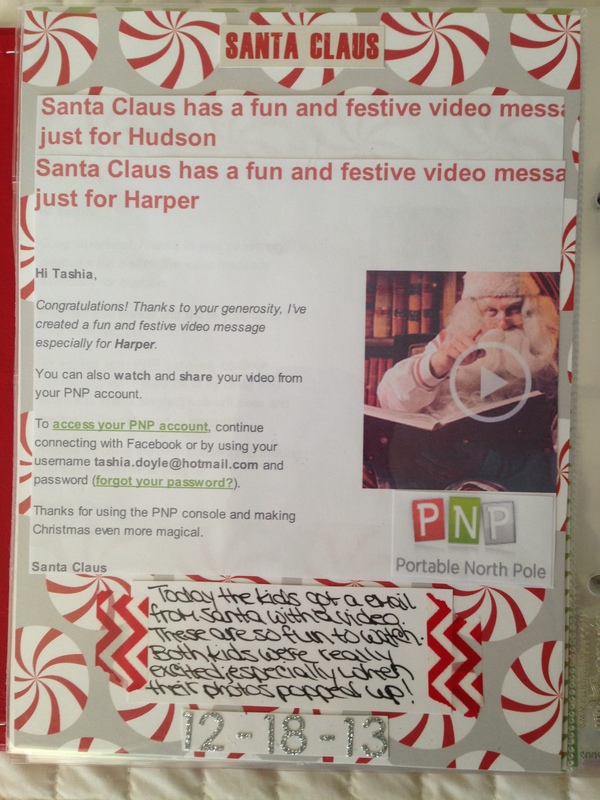 Today the kids got emails from Santa with personalized videos. We do this with them every year and they love it. 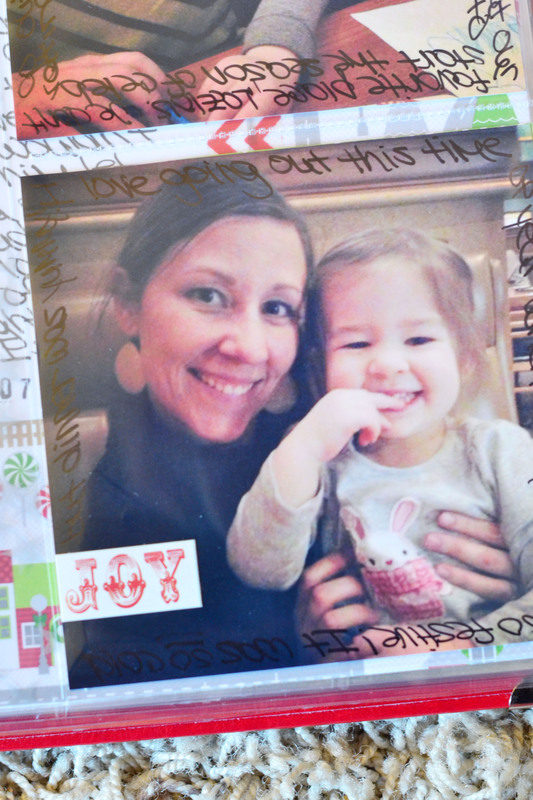 I don’t think I added it to my album last year, but wanted to this year because Harper was able to understand it so much more and actually got excited about seeing Santa and her pictures in the video. 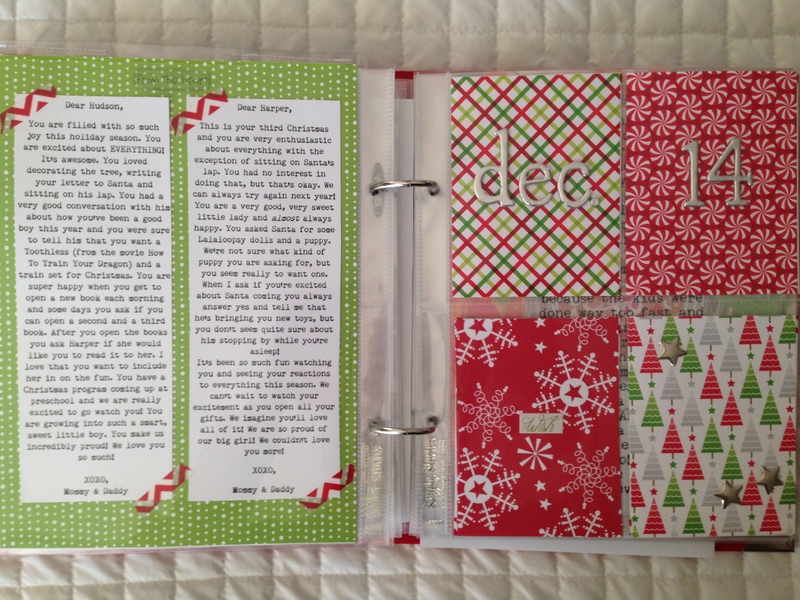 One the left side, I included the emails and a little journaling. 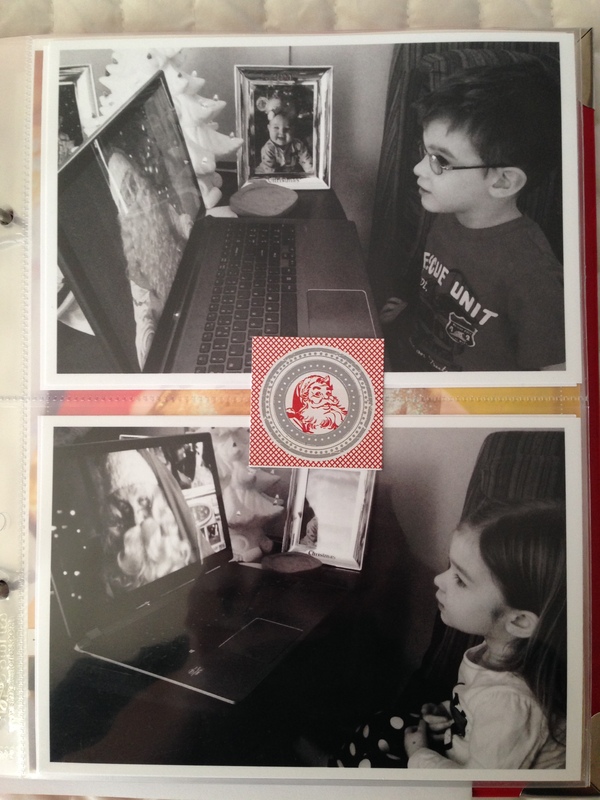 On the right side, I included photos of the kids watching their videos. I took the photos with my iPhone after it was dark out and the quality wasn’t the greatest, so I decided to make them B&W. Not what I planned, but I’m happy with how the spread turned out. Today we had Hudson’s preschool program. I couldn’t wait to watch him and be able to add this to the album. 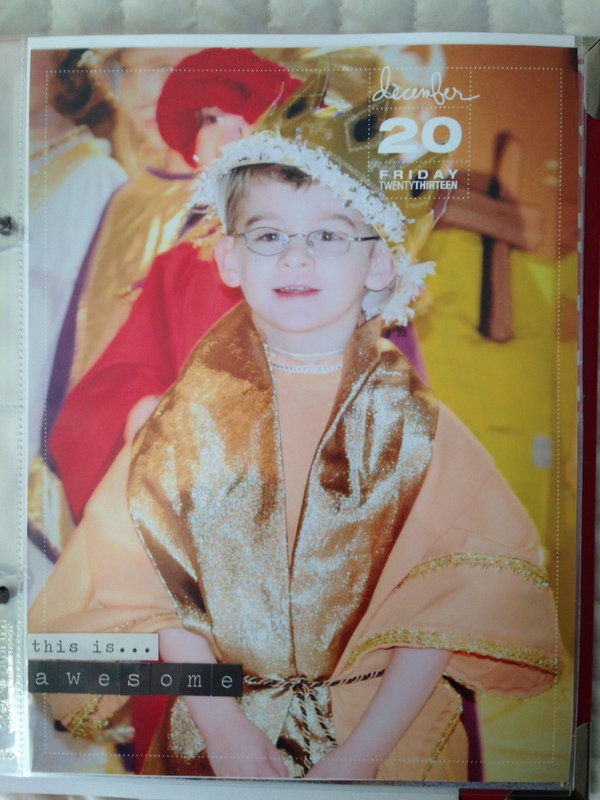 He looked adorable in his wise man costume! 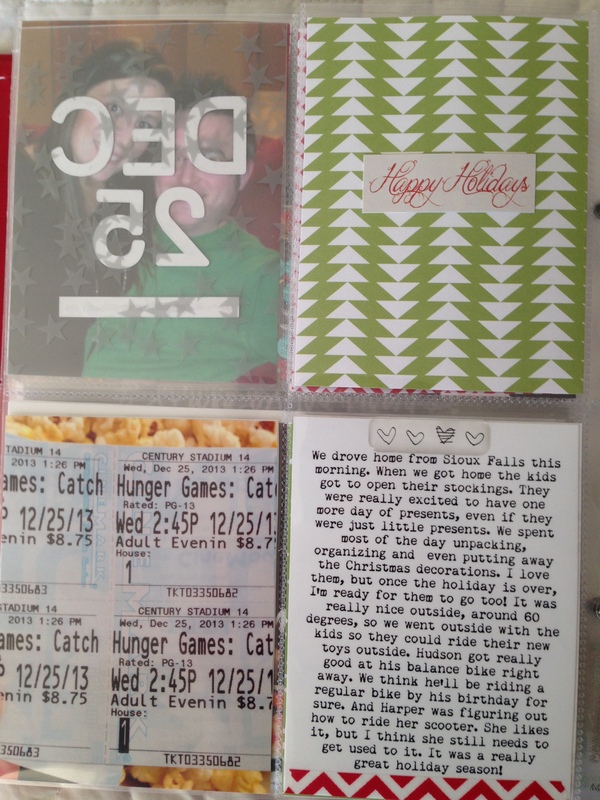 On the left I added a photo of him during the performance and then a 4×6 journal card which I created lines on using gold washi tape. 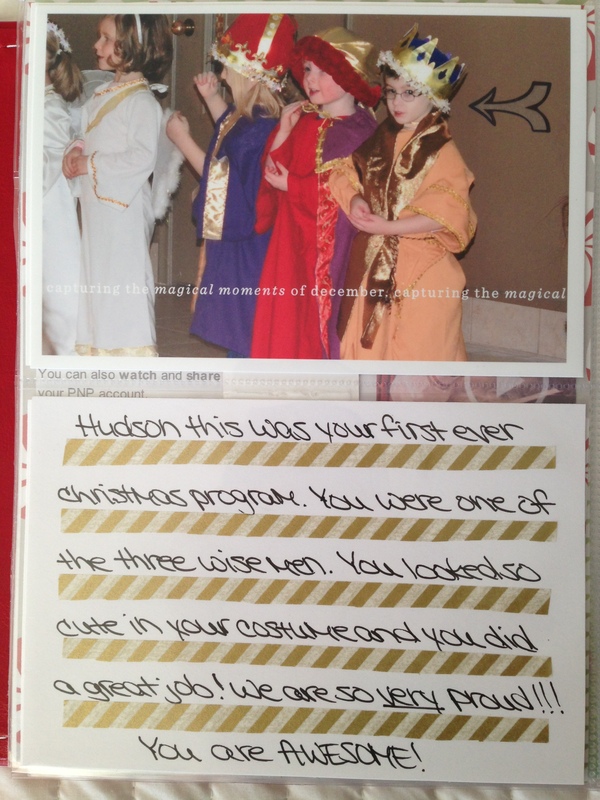 On the right side I added an enlarged photo of Hudson taken after the program. I can’t get over how big his crown was on his head! So adorable! Today we took the kids on a drive to check out all the Christmas lights. They love this as much as we do. It’s always fun. I took a few photos and decided to create another collage to be able to add all of them. Sometimes it’s just too hard to choose just one of two photos. Today we had Jeremy’s family over to celebrate Christmas with them since we were going out-of-town on Christmas. I loved this photo of Jeremy and Harper and knew I wanted to include it, but I also wanted to include a photo of all the grandkids. In the other pocket I added some paper and journaling. Today was the day I finally finished and gave the kids their Christmas pillows. Wow, was that an undertaking, but so, so worth it! They love them! For the day I created a kind of cover page using Studio Calico sequins that I just love and some patterned paper with twenty-four stitched onto it. Love. This is our big day when we have a chili dinner and open all our gifts from family, so I wanted to make this spread special. We also had some extra family members in town, which was even more special. I added a photo of our tree with all the presents on the left side. It is almost ridiculous how many gifts there were! 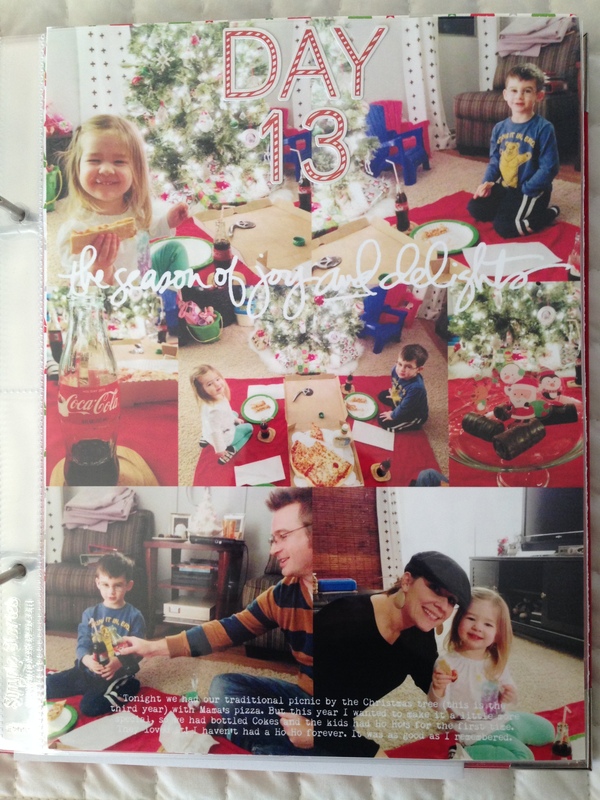 Then on the right side I added a photo of my uncle and cousin from Dallas, some journaling and a photo of Hudson and Harper sitting among their giant piles of presents. This is the back side where I added a few more photos from that night. I just love the photo of Harper and her cousin Emmy playing in Emmy’s new tent! 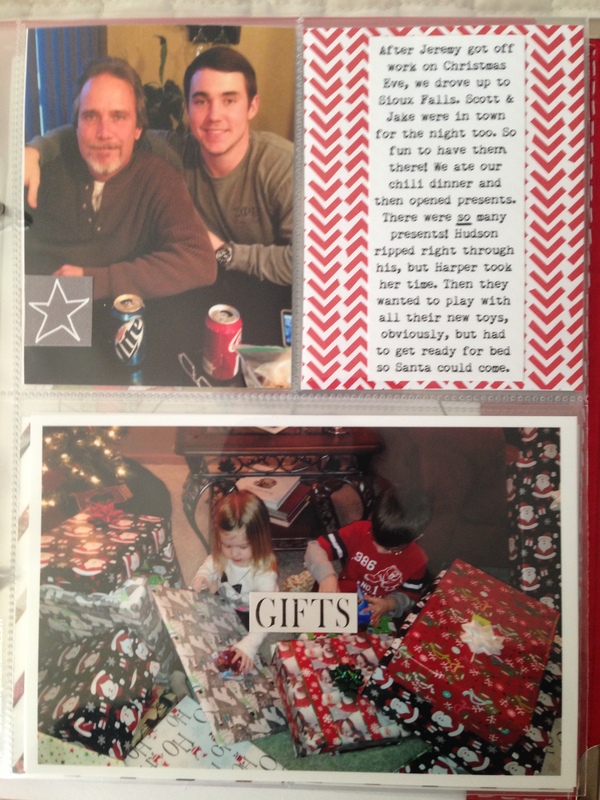 I also wanted to include a photo of Jeremy and I, as well as a photo of the kids with Santa’s cookies. I didn’t take a ton of photos today. It was mostly about just enjoying time with family. 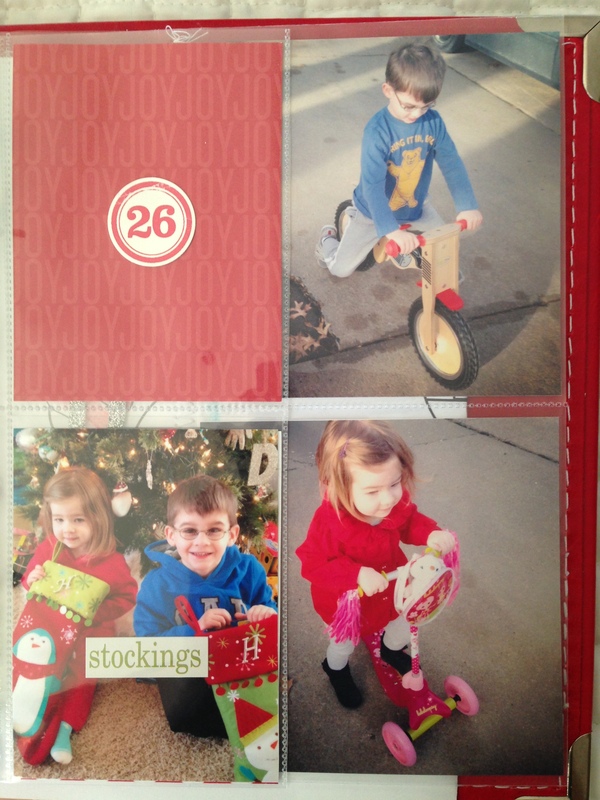 I added a couple of photos of the kids. The one of Hudson just kills me! He had just walked out to see that Santa brought him a balance bike. Priceless. 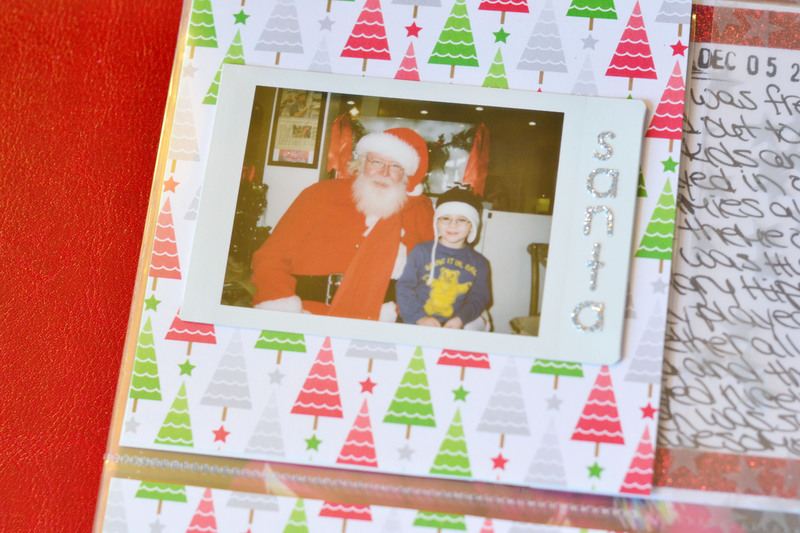 I also love that Santa paper. 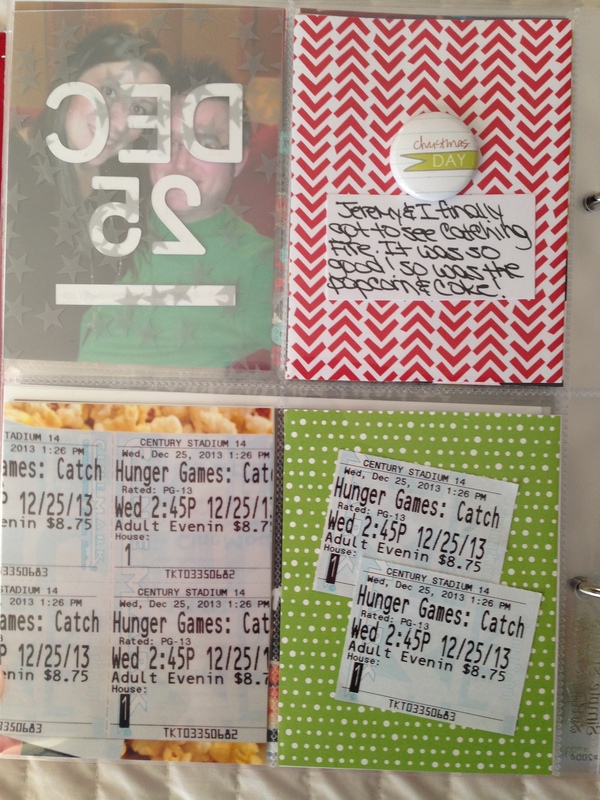 Here is the back side with just includes a photo of movie tickets and then the actually tickets in the other pocket. Jeremy and I sneaked away for an afternoon date to see Catching Fire while the kiddos were napping. We don’t get very many opportunities to go to the movies and my mom insisted, so we took advantage. 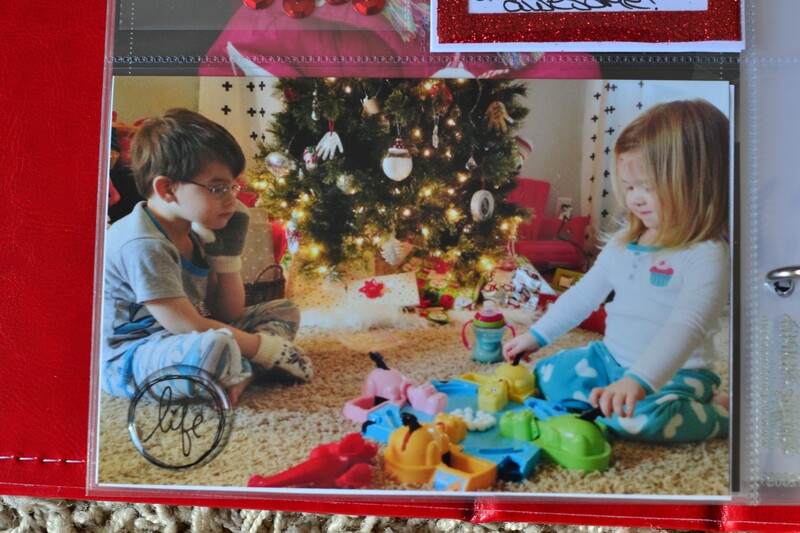 Normally I don’t add December 26 to my album, however, we drove back to Omaha on the 26th and the kids got to see what Santa left for them in their stockings, so I wanted to include that too. The weather was also extremely nice for this time of year, so the kids got to get outside and ride their new toys. 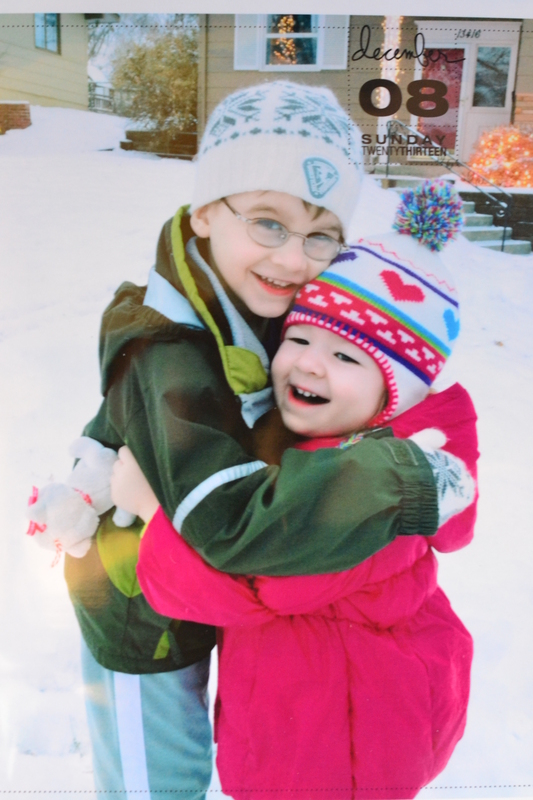 I had to document them outside playing without coats on December 26th! That never happens! So there you have it! My completed December Daily album. I love it so much. I couldn’t be more pleased with how it turned out. 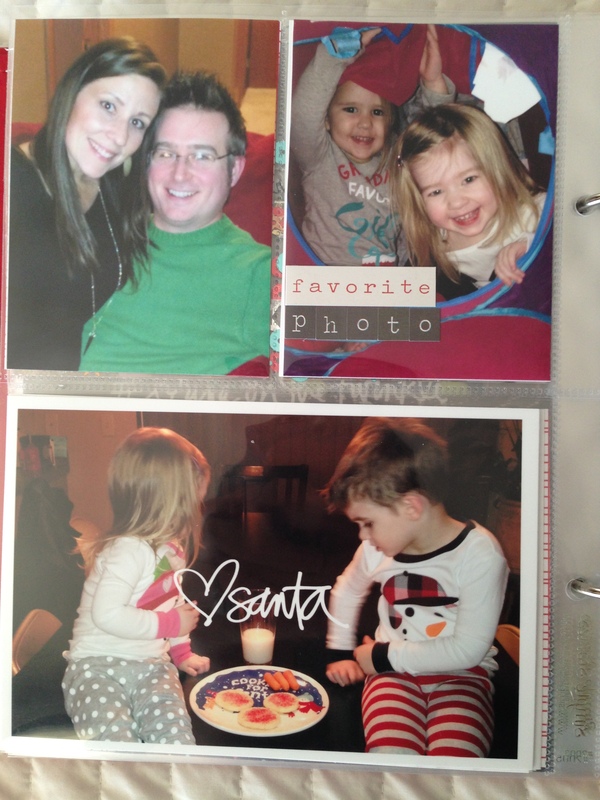 I’m so glad I used a smaller sized album this year. The 6×8 size worked out perfectly for me. I really like how some pages are extremely simple and others are much more embellished. I think the mix works well. I like the mix of different pocket pages. It added so much character to the spreads. I’m glad I chose to add the see-through, sequins pockets. They’re a fun addition. I think having some days consist of just one page and others filling two or more made it easier to keep up with the documentation. In my previous albums I sometimes had a hard time filling up two full 8 1/2×11 pages and it became a little stressful at times. Some stories simply don’t need two full pages. These albums are amazing keepsakes. It’s so much fun to look back at previous years and reminisce. 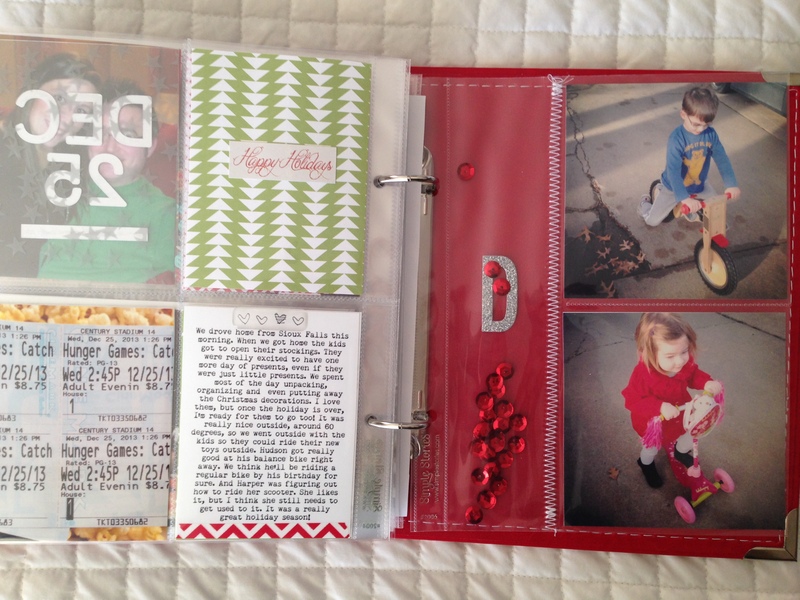 I started making these Harper’s first Christmas and plan to continue until I no longer feel that I have stories to tell…although, I highly doubt that will happen while the kids are still living with us. It takes some focus and work to complete these, but it’s so worth the time and effort. If you have any questions about any of the supplies I used, feel free to leave a comment. I’m back with another day of December Daily, and I’m really loving how the book is turning out. Day eight is my favorite! Today we went out to dinner, which doesn’t happen all that often, so it was sort of special. I decided to make that my story and kept the page really simple. 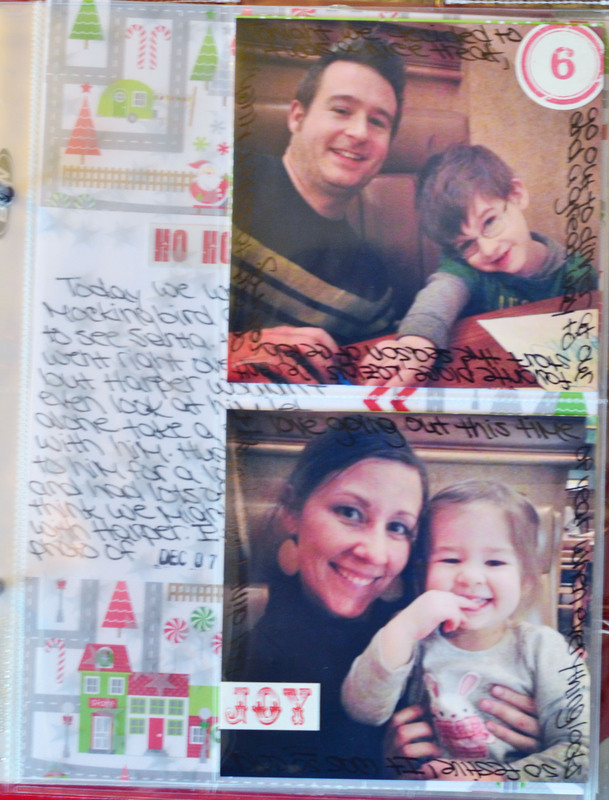 I wanted to use one of my page protectors with the two 4×4 slots, so I turned two photos from dinner into Instagrams, printed them, and then added some journaling right onto the photos. Easy. And you can see that there is a thin pocket on the left side. I simply cut a piece of the star screen print. I knew whatever I used would be seen on the other side and that’s what worked the best. 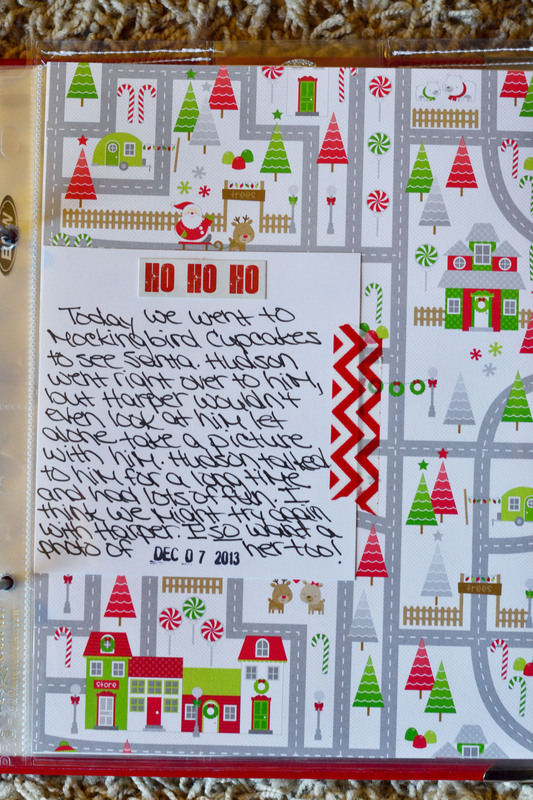 Today we took the kids to see Santa at a cupcake store. Hudson was super excited, but Harper wouldn’t even go near him! They were offering Polaroid photos for $5, so we got one of Hudson. It turned out great! I still plan to try to get one of Harper this coming weekend. That’s why I left the bottom pocket open. Fingers crossed! 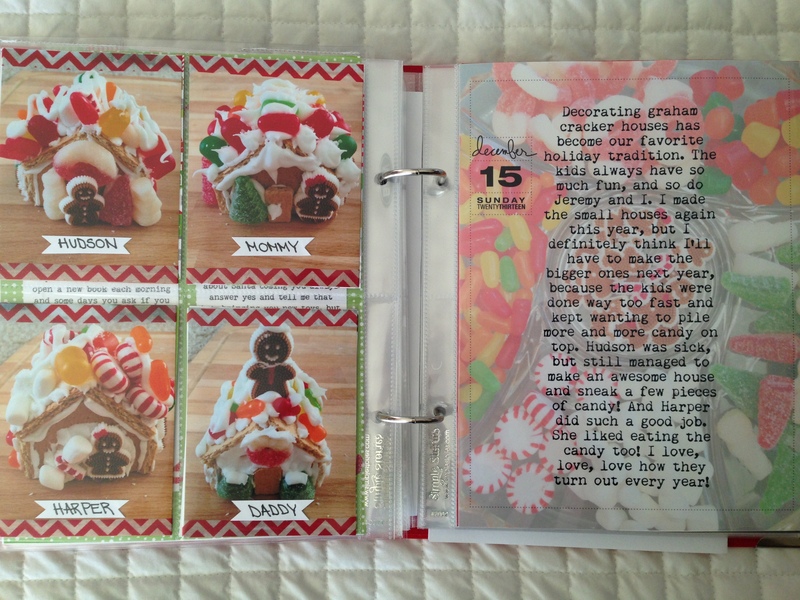 I love this cute paper for pages with the kids! 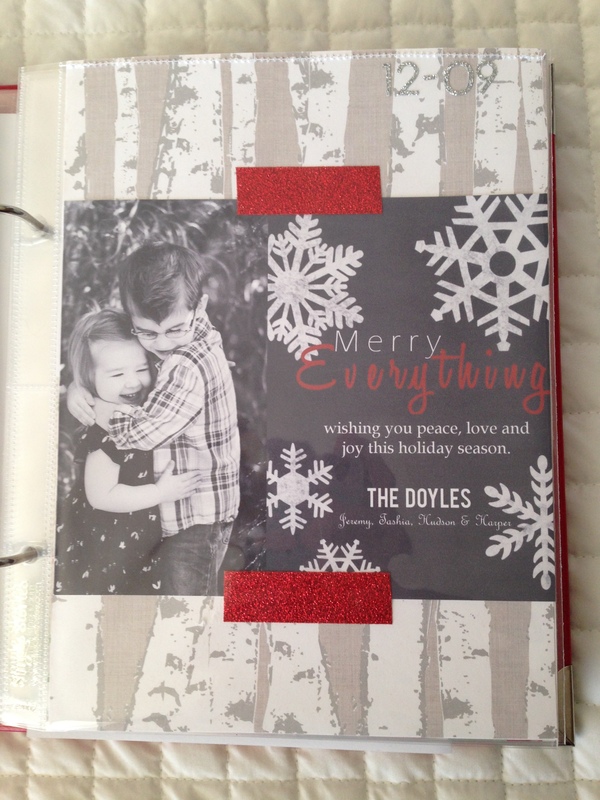 It’s a little more cutesy than I would normally use, but it works for this album. It snowed today!! The kids were so happy! We didn’t get to stay outside very long because it was bitter cold, but they made the most out of the time they had. I can always count on big hugs! I wanted to add something really special today because I had extra time to work on it. 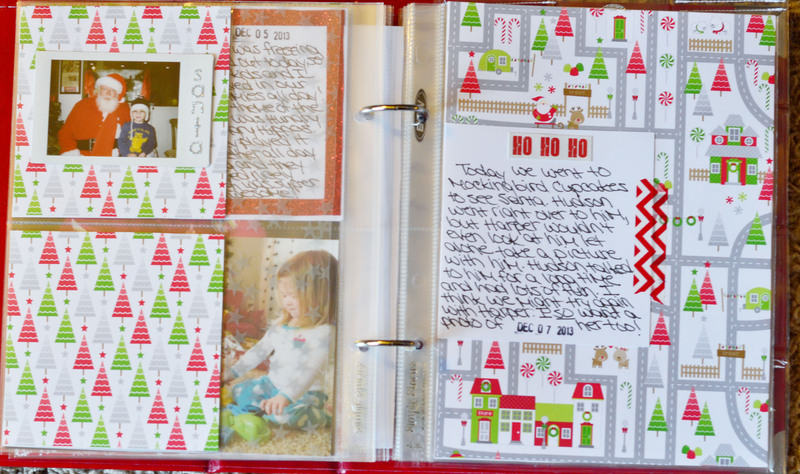 I came up with the idea of using a coin pocket page. This definitely isn’t a new idea, but I’ve never done it in a December Daily before. Oh man, I love, love, love this page! 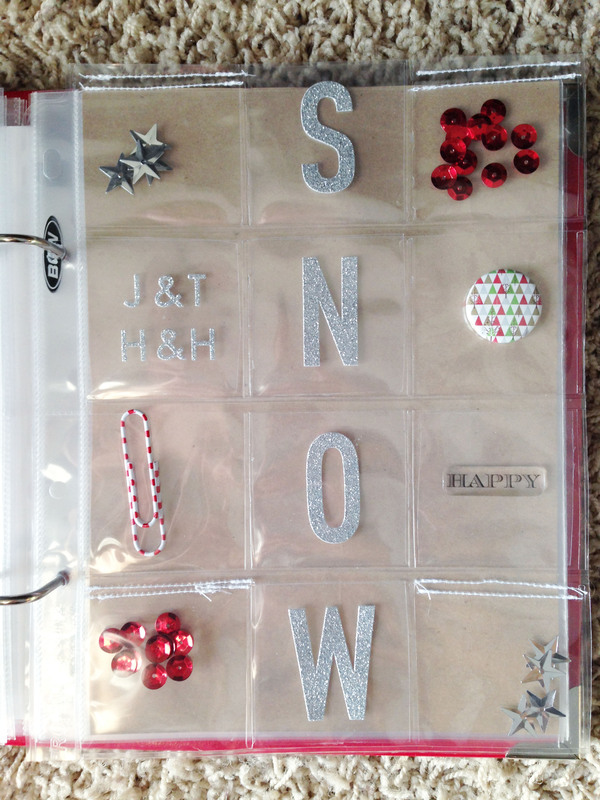 I added different things to each pocket and spelled out the word snow with big silver glittered letters. I also added our first initials to a pocket and eight silver stars, four in each pocket. I also added a paper clip from two years ago, some red sequins and a flair button from aflairforbuttons on etsy. So fun! Thanks for stopping by to check out my album! I’m back with day five of my December Daily album. We had a very low-key day yesterday. It was freezing cold outside, so the kids and I stayed in our comfy clothes and didn’t leave the house all day! I got out Hungry Hungry Hippos for them in the morning and they played it all day long. That almost never happens! They had so much fun playing together and not only did they play together, but they were nice to each other. It was awesome! I knew that had to be my story for the day. It doesn’t have anything to do with the holidays (except that they were playing close to the tree! ), but it’s our real life right now and that’s what I want to remember. Here’s a look. And this time I kept it to one page instead of a two page spread. 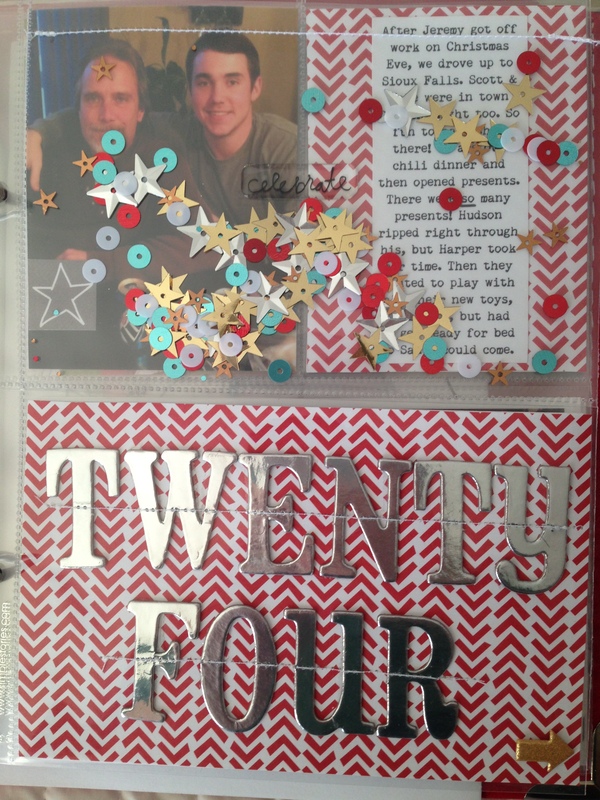 I made the journal card with cardstock and glitter tape cut into strips. Simple. P.S. I love how Hudson is wearing mittens! That’s so him! Ha ha! I’m planning on posting today’s and Saturday’s pages on Sunday if you want to come back and check them out.